The Western frontier was a hard place to live but for a woman living alone, it could prove to be too much. This is the theme at the centre of Emma Tammi's The Wind. Caitlin Gerard (Insidious: The Last Key) stars as Lizzy, a young woman living alone on the frontier in the late 1800s, driven to madness by the isolation and hardship of the rough surroundings. The desolation proves to be too much and she comes to believe that the wind brings evil with it. In addition to Gerard, the movie also stars Julia Goldani Telles (Slender Man, "The Affair") and Dylan McTee as the Harpers, a young couple who moves into the adjacent property. It's great to see that westerns are still making an appearance here and there but I'm particularly excited by the fact that the genre has taken on new life with women's stories front and centre and The Wind seems to be great company to movies like Brimstone (review) and The Keeping Room (review). 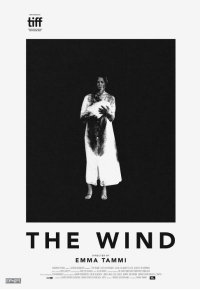 The Wind, which premiered at TIFF last year, will be screening at International Film Festival Rotterdam later this month.